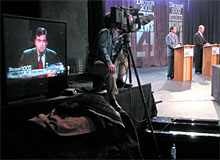 At a debate for gubernatorial candidates in Santa Fe on Wednesday, rivals Bill Richardson and John Sanchez borrowed well-known lines from national candidates in televised debates in the 1980s. The debate, sponsored by The New Mexican and KOB-TV, which aired it live, took place at The Armory for the Arts. Green Party candidate David Bacon also participated. Democrat Richardson confronted Republican Sanchez for repeatedly calling him a "career bureaucrat" during the campaign. Noting that Republican U.S. Sen. Pete Domenici had been in Washington, D.C., for 30 years, Richardson asked if Sanchez's criticism applied to the senator. Recalling Sen. Lloyd Bentsen's famous retort to Sen. Dan Quayle in the 1988 vice presidential debate, Sanchez told Richardson, "I would say this, Mr. Richardson: You're no Pete Domenici." Richardson sarcastically replied, "That's original." "There you go again. ..."
Indeed, at times both Sanchez and Richardson seemed to be repeating well-worn attacks and counterattacks from past debates - with Sanchez questioning Richardson's sincerity about cutting taxes and Richardson saying his experience and skill as a negotiator makes him the most likely candidate to get a tax cut through the Legislature. However, Sanchez sharpened his attack when he said Richardson in his first campaign for Congress in 1980 "attacked a great New Mexican," then-incumbent Rep. Manuel Lujan Jr., a Republican, because the state's per-capita income ranked 40th among the 50 states. Sanchez noted that during Richardson's years in Congress, "we fell from 40th to 48th." "Should the same standard be applied to measure your record?" Sanchez asked the Democratic candidate. Richardson replied he and Lujan had worked well together. Although he never directly answered Sanchez's question, he said he fought for many issues to help the state and pointed out he had been re-elected several times with margins of more than 60 percent. Although they took jabs at one another, all three candidates seemed less tense than at previous debates. At times, they actually smiled at each other, and unlike a previous forum in Albuquerque, all three shook hands afterward. Though much of the wrangling was between the major-party candidates, Bacon was on the receiving end of criticism, especially from Richardson, who hammered at the Green's plan for the state to take over the sale of natural gas extracted from state land. Bacon defended his idea when asked about recent criticisms from state Land Commissioner Ray Powell Jr., who says the plan would create a huge bureaucracy, would be risky because of fluctuating prices for natural gas and would invite lawsuits from current lease holders of state lands. "I disagree with Ray on that one," he said. "We don't have to create a huge bureaucracy." He repeated his contention that the state should stop taking "pennies on the dollar" for its natural gas. Richardson brought up the fact that Bacon said Bacon would consider drilling for gas on state land near Otero Mesa in southern New Mexico. "I disagree," the Democrat said. "You've taken a position less Green than Bill Richardson." Bacon said he would support drilling near the land, which environmentalists say is prime desert grassland, only if it could be done without harming the ecology. Sanchez noted he is the only candidate who supports drilling for gas on the federal land at Otero Mesa. He said it would create jobs. He said the gas and oil industry "butters the bread" of the state's economy. All three candidates favored tax credits for the creation of alternative energy. Richardson repeated his goal of seeing the state have 10 percent of its energy coming from renewable-energy sources, such as wind or solar, and said excess energy could be sold by the state, possibly to Mexico. Bacon said the state should provide incentives for homeowners to produce their own energy that could be sold back to the electric company. He said his home has a solar system that does that. "When the sun shines, the meter turns backward," he said. The candidates were asked about how they would have handled the Our Lady of Guadalupe controversy last year, when many Catholics protested an artwork on display at the state Museum of International Folk Art that depicted the Virgin clad only in flowers. Both Richardson and Sanchez said they would have worked to bring both sides together. Richardson  whose position favoring a woman's right to abortion has caused some recent controversy in the Catholic Church  said he was offended by the artwork and he supported Archbishop Michael Sheehan's efforts to have the piece removed from the museum. Bacon said he would have asked the state museum to open a separate exhibit on the history and importance of the Virgin of Guadalupe. Sanchez, who opposes liberalizing drug laws, though he has admitted to smoking marijuana as a teen-ager, was asked whether he should have been arrested for the crime. He responded no. "Children make mistakes," he said. "We need parents who understand children and provide a stable environment. Richardson has accepted hundreds of thousands of dollars from Indian tribes who own casinos  and has used a plane from the Mescalero Apaches for his campaign travels. He was asked whether, in light of these contributions, he would continue litigation against the Mescaleros and Pojoaque Pueblo. Those tribes are the only ones that did not sign gaming compacts with the state. Richardson said he would enforce the law and abide by the gaming compacts. But he said some of the problems between the states and the tribes had occurred because Indians haven't been included in state government. He reiterated his pledge to appoint Indians to the cabinet, state boards and commissions.